Seven activists will spend up to four years in prison. 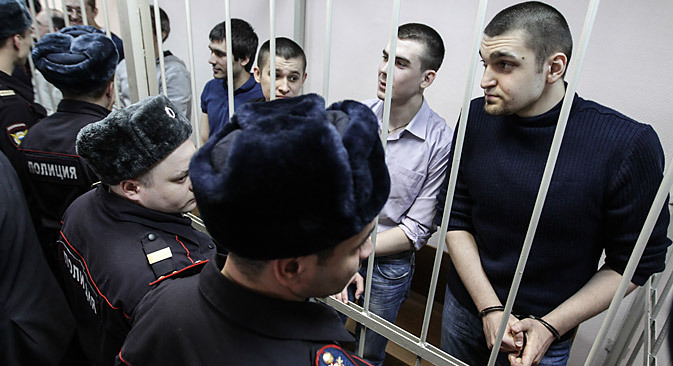 On Monday, Feb. 24, the Zamoskvoretskiy District court in Moscow announced its verdict in the case of eight opposition activists accused of involvement in mass protests on Bolotnaya Square on May 6, 2012. The judge began to announce the court’s verdict on the previous Friday, but managed to read only part of the lengthy document before the court closed for the day. The complete verdict stated that the accused were participants of the March of Millions protest on Bolotnaya Square on May 6, 2012 - an event that ended in clashes with the police – and were guilty of using violence against representatives of the authorities and participating in a mass riot. Initially, 12 defendants were on trial, but four of them were released under last December’s amnesty in honor of the 20th anniversary of the Russian constitution. The eight remaining defendants faced charges that included attacking police officers and therefore did not qualify for the amnesty. One defendant, Alexandra Naumova received a suspended sentence of 3 years and 3 months; but the rest will spend time behind bars: Andrei Barabanov – 3 years and 7 months; Sergei Krivov 4 years; Yaroslav Belousov – 2 years and 6 months; Artem Savelov – 2 years and 7 months; and Stepan Zimin, Denis Lutskevich and Alexander Polikhovich – 3 years and 6 months each. The damage caused by the actions on Bolotnaya Square has been evaluated at 28 million rubles ($800,000 dollars). Zimin’s and Savelov’s sentences were shorter than the minimum penalty for their crime stipulated in the Russian Penal Code due to their health problems. All eight have already served part of their sentences. The prosecution had asked for sentences of between five and six years, experts and observers called the sentences lenient and appropriate. Mikhail Fedotov, head of the Council for the Development of Civil Society and Human Rights under the office of the Russian President said: “The sentences handed down by the court have proved much more lenient than what the prosecution had asked for,” adding that he hoped the sentences would eventually be commuted. Igor Bunin, head of the Center of Political Technologies, agreed that the sentences were more lenient that expected. “I would describe such an approach as herbivorous rather than cannibalistic,” Bunin said. Markov, like Bunin, said there was little chance of the verdict triggering any further rioting, although he did not rule out smaller protests. According to the Moscow police department, about 200 people were detained outside the court when the verdict was being read out. Among them were opposition activists Alexei Navalny, Nadezhda Tolokonnikova, Maria Alekhina, Petr Verzilov, and Ilya Yashin. More than 50 people were detained outside the court last Friday. Bunin said that although some protestors were detained, “I don't expect anything more serious than that." According to some reports, Russian opposition activists were planning to stage a “people’s gathering” on Manezhnaya Square in Moscow in the wake of the verdict. The Moscow mayor’s office has said, however, that any unauthorized events will be broken up by the police. “The municipal authorities have not been notified of any events, but we are aware that a gathering is planned. We have already passed on this information to the police, who will prevent any attempts to hold an unauthorized event,” said Vasiliy Oleynik, deputy head of the department for regional security of the Moscow municipal government. Based on materials from Kommersant, Vedomosti and ITAR-TASS.